Out of all the organized tours and classes I took in Malaysia, this day long hike in Malaysia’s rainforests turned out to be my favorite of all (I know, a non-food activity!). Perhaps it was because I love the outdoors. Or maybe it’s because the Malaysian jungle is so different from anything I’ve ever seen before. 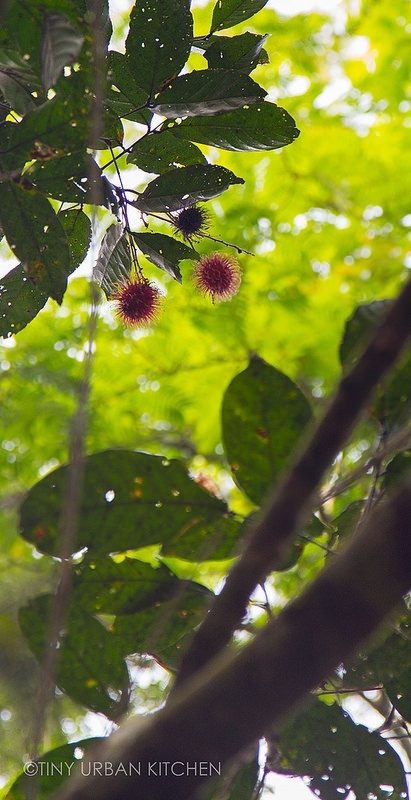 I was fascinated by the plethora of tropical fruits that were growing in the forest. It could even be due to the delicious authentic meals we had pre and post hike at a mamak, an Indian Muslim restaurant. I’m sure it was all of those things. On top of all that, most importantly, our tour guide Amos (who owns the business Open Sky Unlimited and runs all of the tours), was fantastic. He was extremely organized, very responsive, kept us safe at all times, and was just a really pleasant person with whom to talk about all sorts of things. I felt like I made another friend by the end of the hike. Our day started super early. Amos came by my hotel at 6:10AM with a van full of two other hikers. It would just be the four of us today. Amos only takes a maximum of four people on any given tour, so the overall feel is small and intimate. We drove through the dark about an hour and a half away to arrive at a mamak for breakfast. The breakfast was fantastic, and you can read more about it in this post. After filling up on breakfast, we headed out towards the trailhead, which was right on the edge of the rainforest. By this point, the sun had come up. We arrived at a small neighborhood inhabited by the indigenous tribes, who are the only people legally allowed to pick produce from the rainforests and sell them at the local market. They live right at the edge of the rainforest and bring the goods into the city markets. Part of the trail that we would be taking was created by the indigenous people to carry fruits out of the jungle. And we were off! The trail started flat but started to go uphill after a couple miles. Check out all the bamboo trees around! Amos told us that you always carry a machete when you hike. In Malaysia, where trails are not well kept and hiking is generally more “rough” than in the U.S., you often need to use your machete to create a path in front of you. Anyone who is not carrying one is seen as an inexperienced novice who shouldn’t be hiking in the jungle. The jungle is ever changing due to wind, rainfall, and the elements. We saw so many different exotic fruit trees. Pictured above you can see jackfruits growing on trees. To the right is a rambutan tree. Here’s a close up of the jackfruit. This is a ginger flower. Isn’t it gorgeous? We picked several fruits right off the trees and ate them! On the left is a mangosteen; on the right is a duku. Both of these fruits have a sweet, almost creamy white flesh on the inside that is very sweet. We had just missed the tail end of durian season, so most of the durians had been picked and brought to be sold at the market. We did manage to see one durian still hanging on a tree. Can you see it? It’s in the picture above on the right (there are tons of jackfruit to the left of the photo). Whatever durians were left had fallen to the ground and had turned black. Thankfully, they didn’t smell anymore, although Amos told us that if we had been hiking just a month earlier, it would have smelled really bad with all the fresh durians on the ground! We saw a baby banana tree. We also saw rows and rows of rubber trees. These trees were actually planted here intentionally, which explains why they are in such neat rows. You can tap these trees for rubber daily for decades. You just never know what might get in the way of the path! And then one last obstacle: crossing the stream at the base of the waterfall! We took off our shoes and carefully made our way across the smooth and slippery rocks. Because Malaysia is tropical and hot all year round, the water was actually pretty warm. The air also felt much cooler and more comfortable than the city, where it was easily 90-100 degrees Fahrenheit. The final destination of the hike was this gorgeous waterfall. We were the only people there, and we all took a nice long extended swim. Amos challenged us to get right under the waterfall. I am not a good swimmer and I sort of freaked out, but he was really encouraging about it, and I was so glad that I mustered up the courage to do it. It was a bit tough for me, mentally (after all, I kind of hate getting my face wet, a consequence of learning to swim too late in life!) but I did it! And I have photos to prove it! After frolicking in the water for about 10-20 minutes, we all got out and just enjoyed the sunshine as we dried off. It was disappointing to see a pile of trash left by another group of irresponsible hikers who had picnicked in the area earlier. I was really moved to see Amos slowly take out his own trash bags, pick up all the trash, and attach the bags to his backpack to carry back out of the forest. Unfortunately, because these trails are not really maintained by any official body (it’s not a state or national park), maintenance comes down to volunteers who really have a love for hiking and care about preserving the environment. Because we had some extra time, Amos took us to another babbling brook where we entered for yet another swim! This one was much tamer, since there was no huge waterfall – just a brook that was passing by. It was soooo relaxing just to sit in the water while enjoying the scenery. Again, there was no one else in sight, so we had the area all to ourselves. Near the end of our time in the water, we felt a few drops. Rain showers were on their way, so we got out of the water and walked just a couple minutes to the car. Amos whipped out a portable changing tent, where we each entered and put on our second set of clean clothes (which he had told us to bring). 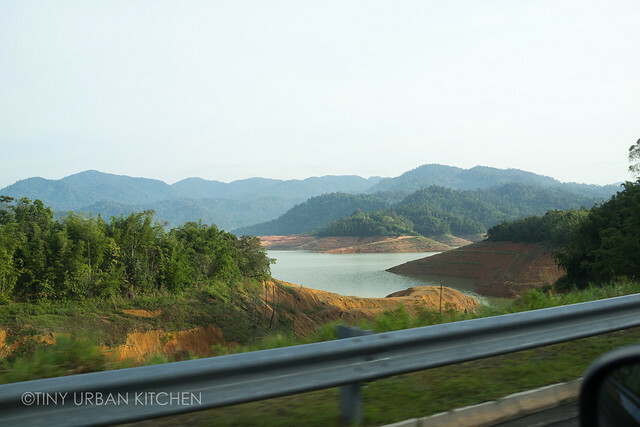 Feeling refreshed, we drove back out of this lovely, remote area to return to the mamak where we had breakfast earlier in the day. We were famished at this point (we had hiked close to 9 miles), which made the lunch all the more satisfying. It was another hour and a half drive back and we got back to town right before rush hour hit (which is exactly how Amos planned it). It was a phenomenal hike. I loved see and learning about so many different types of tropical plants (many of which bear fruit that we could eat!). The waterfall was gorgeous, and standing right underneath it was unreal. But it wasn’t just the hike location itself that made this tour excellent. It was also what Amos taught us throughout the day. I learned so much about various aspects of Malaysian culture. Amos is completely fluent in English (it was one of his first languages growing up), so you can have really in-depth conversations with him. He’ll tell you all about Malaysian food, culture, religion, politics, history . . . the list goes on. I think we hit upon all those topics – partly because I like to ask questions, but also because the hike was four hours long and he was totally happy to converse the entire time. All in all, the overall tour itself was an enriching experience from so many different facets, and I cannot recommend it enough. Thanks to Amos for providing some of the photos of me hiking and swimming. What’s cool is that Amos brings a waterproof camera and takes all sorts of photos during the hike, which he shares with you via Dropbox afterwards.